Clear aligners straighten your teeth without wires and brackets. A series of removable appliances which have been fabricated using computer generated programs are worn to straighten your teeth. 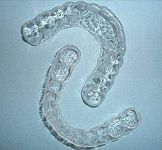 These aligners are clear and virtually invisible. The aligners are worn full-time and are removed only to eat, brush and floss. There are several different companies which make these aligners, Invisalign, being the most well-known. Each aligner is worn from two to six weeks. The exact number of aligners required depends on the severity of your malocclusion. Invisalign is mainly indicated for adults with relatively minor problems. Please call our office to schedule an appointment to see if aligner therapy will work for you!